Plywood and OSB (oriented strand board) structural panels are extremely durable and are manufactured to resist uniform loads perpendicular to their surfaces as well as high loads parallel to their surfaces. Different panel types and grades resist impact loads to different degrees. Moisture and sunlight can affect the long-term performance of all wood products, and APA recommends that untreated or unprotected structural wood panels have limited or controlled exposure to either high moisture levels or direct sunlight. While many wood structural panels have significant exposure to moisture over their service life, those periods are limited in time and followed by opportunities for the wood fiber to dry to moisture content levels below 20 percent. The service life of wood structural panels can be long term if temperatures are below 230° F, exposure to moisture and direct sunlight are minimized and loads are within design levels. See APA Technical Topic Service Life of Oriented Strand Board, Form TT-052, for more information. Plywood and OSB structural panels have varying degrees of impact resistance based on the panel construction. Plywood improves on wood's well-known ability to absorb shock. Its cross-laminated construction helps to distribute impact loads and makes it virtually split resistant. Plywood holds up well to sharp blows, fork tine impact and other in-service abuses, which in turn means lower replacement costs. Surfaces of plywood panels with thicker face veneer or more solid veneers adjacent to the face such as found in Underlayment grade panels are more able to withstand surface impacts. See the Surface Durability section of the web site or APA publication Data File: Selection, Installation and Preparation of Plywood Underlayment, Form L335, for additional information. Plywood and OSB structural panels have varying degrees of resistance to wear. Other considerations for wear resistance are the species of wood in the surface layer, the construction of the panel, and the finish or overlay on the panel's surface. 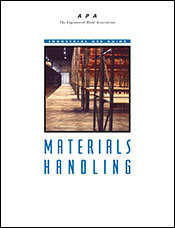 See the Surface Durability section of the web site or APA publications Caster Loadings on Plywood, Form X227, or Materials Handling, Form M200, for additional information. Wood is hygroscopic, and the wood fiber expands as it increases in moisture content and contracts as it loses moisture. This exchange of moisture can contribute to aesthetic (non-structural) degradation of the exposed surfaces of the panels. APA trademarked panels are produced in common bond classifications: Plywood panels in both Exterior and Exposure 1, and OSB panels typically Exposure 1. The bond classification relates to glue bond and thus to structural integrity. 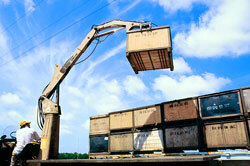 Choose the correct bond classification for your application. Panels with Exterior and Exposure 1 bond classifications are manufactured with moisture-resistant resins. Wet-dry cycle tests were conducted on Exterior-type southern pine plywood by the U.S. Forest Products Laboratory. 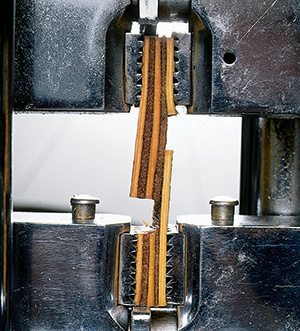 The test cycles of soak to oven dry resulted in severe face-checking (small shallow cracking in the face veneer) but produced no reduction in glueline shear strength. For sheathing applications, face-checking is not a factor from an appearance standpoint. Face checking will appear in various degrees of severity depending upon the exposure and veneer species and grade. Face checking is expected when plywood is exposed to the weather or other cyclic moisture conditions. For practical applications, the wet-dry cycle exposure caused little or no reduction in the stiffness or load-carrying capacity of the panel. Exterior panels have a moisture-resistant bond and are suitable for applications subject to long-term exposure to the weather or to moisture. Wood structural panels have been used successfully in contact with salt or sea water for many types of applications such as bulkheads, pontoons, floats, flood gates, and boats. Contact with brackish or salt water in itself will have little effect on Exterior panels. The salt will have no deleterious effect and the water will merely cause the wood to swell as would exposure to moisture. The major problems with sea water contact are marine borers or decay organisms at the air-water interface. Exposure 1 panels have a fully moisture-resistant bond and may be used for applications where they may be exposed to a short duration of direct moisture in the form of vapor or liquid. 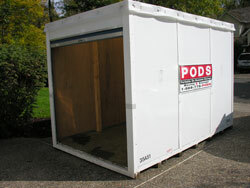 Exposure 1 panels are made with the same exterior adhesives used in Exterior panels. Because other compositional factors may affect bond performance, however, only Exterior panels should be used for long-term exposure to the moisture. Note: Plywood APA Rated Sheathing Exposure 1, commonly called "CDX" in the trade, is sometimes mistaken as an Exterior panel and erroneously used in applications for which it does not possess the required resistance to weather. "CDX" should only be used for applications as outlined under Exposure 1 above. For sheathing grade panels that will be exposed long-term to moisture, specify APA Rated Sheathing Exterior (C-C Exterior plywood under PS 1). For applications where panels will be in direct contact with water for long periods, or subjected to conditions favorable to fungi or insect attack, pressure-preservative treatment should be specified. It should be considered for all long-term exposure. In such applications as tanks, cooling towers, retaining walls, or irrigation structures, consideration should be given to pressure preservative treatment. The greatest risk to wood products is decay. Decay fungi require certain conditions to thrive in plywood or wood. The optimum conditions for decay activity in plywood are a moisture content of above 30 percent and a temperature range of 75° to 90° F (24° to 32° C). Fungus can be dormant in dry or cold periods, and although time without optimum conditions will retard growth, it will not necessarily stop it. Controlling decay involves controlling moisture. When panels are exposed to significant moisture, the panels should be allowed to dry to a moisture content of 20 percent or less to minimize the opportunity for decay to take place.